Light at night is part of the reason so many people don’t get enough sleep. While light of any kind can suppress the secretion of melatonin, blue light at night does so more powerfully. Most of the time, when you’re using an external monitor, brightness cannot be changed in macOS. But this is not an issue for Displays because we’re simulating screen dimming. In latest version 1.5, we also introduced scheduling. 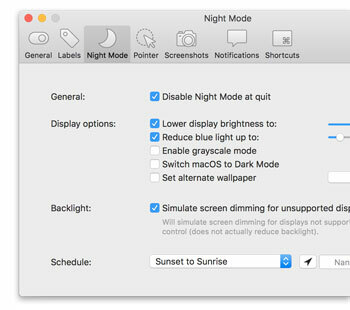 Night mode can automatically be enabled either in a user-defined period of time or based on sunset / sunrise of where you’re living. So you don’t even need to remember to enable the night mode, even if manual mode is still working when scheduling is on. Don’t wait and try Displays for free.